The auction markets were quieter last week as a result of the public holidays across most states and territories, however this week, auction activity is set to rebound with auction numbers close to doubling over the week. Across the combined capital city auction markets, 2,116 auctions are scheduled and over half (1,059) of these will be held in Melbourne, the nation’s busiest auction market. The most significant rise in auction activity will be in Melbourne this week, followed by Canberra and Sydney. Brisbane is the only city where auction activity is substantially lower, with 108 auctions scheduled this week, almost 25 per cent fewer than the 142 held last week. Nationally, the ten busiest suburbs for auctions this week are all located in Victoria. With Glen Waverley (24), Reservoir (19) and Bentleigh East (18) all set to host the highest volume of residential auctions this week. 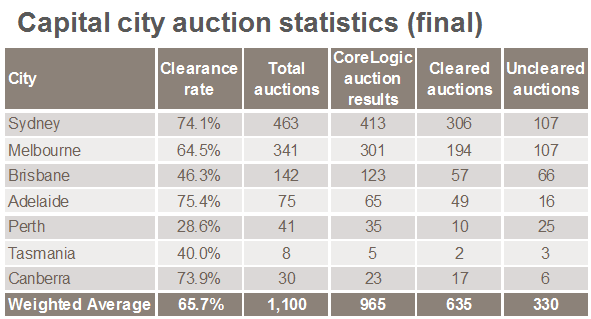 With auction volumes lower last week, the combined capital city clearance rate fell to 65.7 per cent, the lowest result seen across the combined capitals since mid-March. There were only 341 Melbourne auctions last week and the clearance rate fell to the lowest reading over the year to date for the city, at 64.5 per cent, down substantially from 71.1 per cent over the preceding week. In Sydney, auction volumes weren’t as low, with 463 homes taken under the hammer. The city saw a rise in clearance rate, up to 74.1 per cent over the week. In Adelaide, the strongest clearance rate for the year to date was recorded last week, at 75.4 per cent with 75 homes taken to auction. Canberra also recorded a strong clearance rate last week at 73.9 per cent, however only 30 auctions were held. In Brisbane, the clearance rate remained relatively steady, at 46.3 per cent. Across the regional markets, auction clearance rates were strong in Wollongong (76.2 per cent) and Geelong (69.2 per cent), however across the other three regional auction markets, clearance rates remained below 50 per cent.